All arrangements by The Secret Carpet Club, except track 6 by Emma Johansson and track 8 by Carl Nyqvist & Vidar Skrede. Recorded in “Gula Huset”, Lidköping, Sweden, December 4-10, 2010. Daniel Westin, Pontus Thorsson and Hannu Oskala for lending us their recording equipment, and Carl’s family for letting us record in “Gula Huset”. A warm and grooving debut from this Scandinavian folk trio. The sound is an acoustic weave of guitar, fiddle, flute and voices, through summerly tracks pervaded by an attractive combination of sparks and low shoulders. A CD of Scandinavian village music! Village – a debut CD from the Scandinavian folk group The Secret Carpet Club, with Emma Johansson, Carl Nyqvist and Vidar Skrede. While The Secret Carpet Club is a relatively new constellation, the album presents three well-established folk musicians, deeply rooted in their local traditions and, not least, in their own individual musical expression. Guitar, fiddle and various flutes weave together to make a rich, rhythmic and dynamic musical fabric, with Emma’s voice in the foreground and Carl and Vidar providing the harmonic background. Songs and instrumentals are here in equal measure. The material is mainly from Sweden’s west coast, but a Norwegian tune joins the repertoire, along with four tunes composed by group members. The songs range from tender love songs, ballads and chorales to frisky sailor songs, cheeky comic ballads and a shout out over the ocean to missing sailors. The instrumentals offer warm, rich and sprightly polskas, a romantic bridal waltz and a fervent, thundering march by way of conclusion. All in all – a cohesive, dynamic and pleasing album. An appropriate “file-under” genre for this album, bearing in mind its title, is “village music”, but it also belongs under “folk”, “roots”, sometimes “Scandinavian country”, and even “retro folk”. Several tracks reveal a tiny inclination towards Celtic, Canadian and American folk styles, while the warm and somewhat naïve approach to the music shows a certain inspiration from the folk-prog movement of the 70s. But basically this album belongs under “Scandinavian folk”, and this is neither concealed nor solemnly drawn attention to. 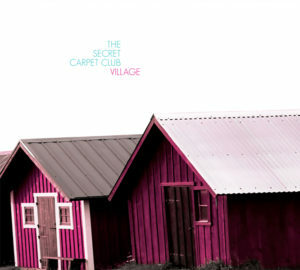 With the album Village, The Secret Carpet Club invite the listener into their living room, onto their carpet, in their musical village somewhere between Norway and Sweden. It is a warm, dynamic album, glancing sentimentally backwards and a flirtatiously sideways to the west. With its pulse and atmosphere, Village represents a heartfelt and playful contribution to Scandinavian folk music, eager to please the ear and get the foot tapping. This is a CD that kicks off with a stunning guitar groove in the sailor song “I dagarna fem” from Klädesholmen in Bohuslän, a tune that could be the parade example of the west wind that is blowing through the band’s music. You can find an Irish relationship in the flute playing, and the fiddle with a vigorous figure, sounds just as much like bluegrass as a Scandinavian fiddlers’ reunion festival.